Idly watching TV tonight, that arch-Movie of super-product placement the 2002 remake of The Italian Job, (with is wonderful use of the BMW Mini cars that are created in Oxford UK) shows up on my screen while i am reading the Sunday newspapers. Before I become uninterested, something catches my eye that sends me scurrying to the computer to check it out. Mos Def is seen reading a book in the movie, and as plain as day the cover shouts out 'HOW TO THINK like Leonardo da Vinci'. Well a true Knignt of the KMSA needs no further urging and i'm off the couch and online almost in one move. Curiosita: An insatiably curious approach to life. Dimonstratzione: A commitment to test knowledge through experience. Sensazione: The continual refinement of the senses, especially sight, as the means to clarify experience. Arte/Scienza: The development of the balance between science and art, logic and imagination ("whole-brain thinking"). Corporalita: The cultivation of ambidexterity, fitness, and poise. Connessione: A recognition and appreciation for the connectedness of all things and phenomena; "systems thinking." Gelb discusses each of these principles in relation to what da Vinci accomplished, thereby giving this book a built-in history lesson. The illustrations from the master's work and time add a nice warmth to the work. Much has been written about Mind Mapping, speed reading, theories of multiple intelligence, and how to integrate mind and body. Having read Michael Gelb's books and attended one of his seminars, I had used many of the techniques with some success, but felt that the brass ring was still just out of reach. Michael's comment was that to take it to the next level you have to change the way you think. Sometimes it takes a human example to understand how something works in practice. 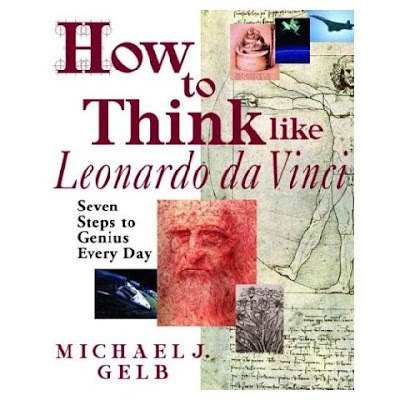 "How to Think Like Leonardo da Vinci" points the way better than a hundred books explaining the theory alone. It breathes life into each of these ideas, and offers you a cornucopia of ways in which to pursue your own personal path and passion. It challenges you to make your own future and rediscover the past. Best of all, it works! So there you have it...its in the shopping cart and on its way to my house as we speak...and lets hope before long I am smiling like the Mona Lisa. Sounds completely compelling! I've been a big Leonardo fan since I can remember. I've even been able to visit his grave and view the Mona Lisa and other masterpieces of his scattered across Europe in person. Sometime, I must admit, I think more like Leonardo Da Caprio than the great Da Vinci! But, an insatiably curious approach to life, testing knowledge through experience, refinement of the senses, embracing paradox and uncertainty, balancing art and science...logic and imagination and recognizing the connectedness of all things pretty much sums me up. My God...I'm a Freakin' GENIUS! I read this one (at least started it) a few years ago. There is no queston the Leonardo da Vinci was connected to the "cosmic catalyst" like no other before or since. As the ultimate Renaissance man, Leonardo da Vinci meticulously recorded his thoughts, musings and sketches in journals throughout his life. Of the 30 that remain, his most famous is the Codex Hammer, named for the British nobleman who acquired the 72-page journal in 1717. Three years after Bill Gates bought the historic diary, he released a digitally scanned version for all the world to enjoy. wow nice one B.... I must go check that out online, if it is on there. Ah yes, a few years ago, I purchased the book, the workbook, the Audio CD and started one or two journals for the process. Obviously I liked the idea and the book as they were all purchased separately. I was so enthusiastic at one time that I gave a copy to my cousin's child hoping it would inspire her troubled life. I now see the books on the shelf to the right of me in my office gathering dust. I need to bust then out again soon for inspiration. But first I have life things.